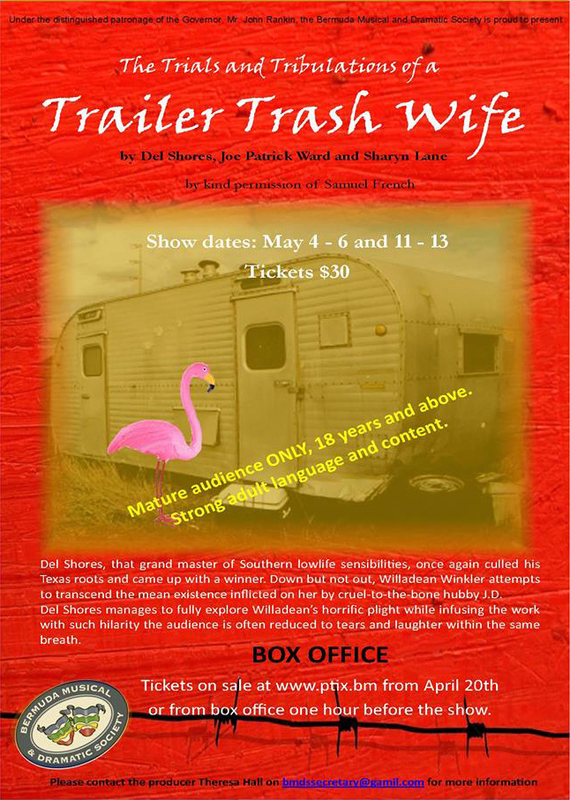 The Bermuda Musical and Dramatic Society [BMDS] is getting set to present ‘The Trials & Tribulations of a Trailer Trash Wife’. A spokesperson said, “This dark comedy, written by Playwright Del Shores, explores the story of Willadean Winkler’s [Brooke Burfitt] horrific existence as a battered woman backed into a corner like a caged animal. “Willadean’s abusive husband J.D. [Stephen Notman], keeps her contained to their trailer and disallows her to work. He resents her for their daughter getting killed in a traffic accident and for having a gay son and stops at nothing to abuse and humiliate her. To make matters worse at the Winkler household, J.D. starts an affair with the new trailer park neighbour Rayleen Hobbs [Kelly Gilmour]. “Strikingly accompanied by Blues Singer [Sheila Smith] and Pianist [Tom Ray], music accompanies audience through difficult scenes and Willadean’s desperate attempts to escape. Willadean’s neighbour and best friend La Sonia [Samantha Smith] begs her to leave J.D. before his violence goes too far. La Sonia, a black woman, also becomes subject to J.D.’s verbal abuse and racism, adding another difficult layer to the play. “Bermuda Musical and Dramatic Society director Nicola Flood gives the audience an intimate look at what drove J.D. to unrelenting evilness. “Show dates are the 4th to the 6th and the 11th to the 13th of May at The Daylesford Theatre. Tickets are $30 and available at ptix.bm.